ESP8266 Wi-Fi transceiver provides a way to connect a microcontroller to the network. It is widely used in IoT projects as it is cheap, tiny and easy to use. We have previously used it to create webserver using Raspberry webserver and Arduino webserver. If your completely new to ESP8266 Wi-Fi module visit the below links to get familiar with ESP8266 Wi-Fi module. 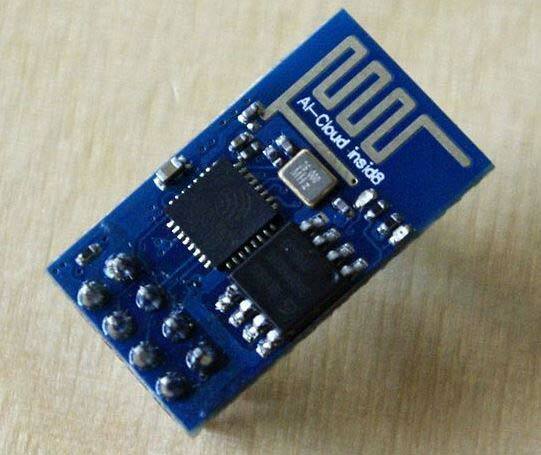 ESP8266 is a low cost widely used Wi-Fi module for embedded projects which requires a low power of 3.3V. It uses only two wires TX and RX for serial communication and data transfer between ESP8266 and any microcontroller having UART port. ESP8266 requires a constant supply of 3.3V and it is not breadboard friendly. So in our previous tutorial on ESP8266, we made a circuit board for ESP8266 with 3.3V Voltage regulator, a RESET push button and jumper setup for switching modes (AT command or flash mode). It can also be setup on breadboard without using perf board. All the ESP8266 based projects can be found here. In order to interface ESP8266 with LPC2148 we must establish a UART serial communication between these two devices to send AT commands from LPC2148 to ESP8266 to configure the ESP8266 Wi-Fi module. To know more about ESP8266 AT commands follow the link. So in order to use UART communication in LPC2148 we need to initialize UART port in LPC2148. LPC2148 has two inbuilt UART ports (UART0 and UART1). As we know that the pins of LPC2148 are general purpose pins so we need to use PINSEL0 register for using UART0. Before initializing UART0 lets know about these UART registers used in LPC2148 for using UART feature. The table below shows some important registers used in programming. In our future tutorials we will see briefly about other registers used for UART in LPC2148. 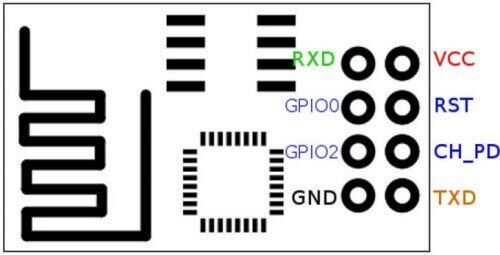 ESP8266 is powered via a 3.3V voltage Regulator and FTDI & LPC2148 are powered from USB. 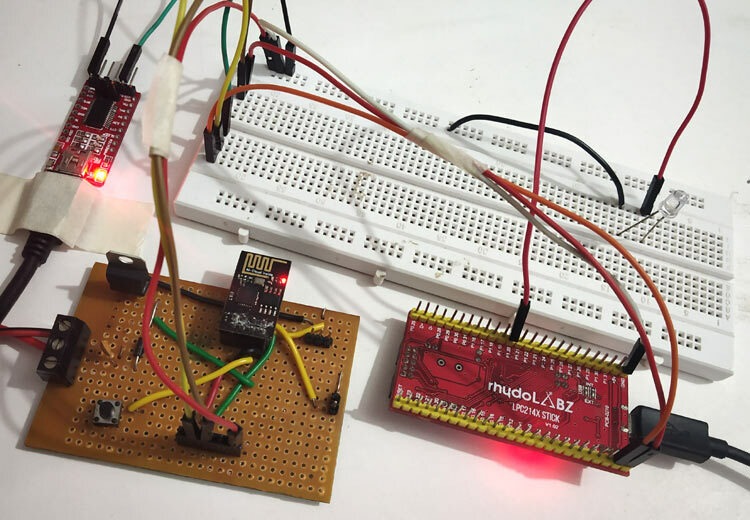 In this tutorial we have connected the RX pin of FTDI (USB to UART TTL) to the ESP8266 TX pin which is further connected to LPC2148 RX pin, so that we can see the response of ESP8266 module using any terminal software like putty, Arduino IDE. But for that set the baud rate as according to baud rate of ESP8266 Wi-Fi module. (My Baud Rate is 9600). Below are the programming steps to connect ESP8266 with LPC2148 which will make it IoT compatible. Step 1:- First we need to initialize the UART0 TX & RX pins in the PINSEL0 register. Step 2:- Next in U0LCR (Line Control Register), set the DLAB (Divisor Latch Access Bit) to 1 as it enables them and then set no of stop bits as 1 and data frame length of 8-bit. Step 3:- Now important step to be noted is to set the values of U0DLL & U0DLM depending upon the PCLK value and the desired baud rate. Normally for ESP8266 we use baud rate of 9600. So let’s see how to set 9600 baud rate for UART0. Step 4:- Finally, we must make DLA (Divisor Latch Access) disable set to 0 in LCR. Step 5:- For Transmitting a Character, load the byte to be sent in U0THR and wait until the byte is transmitted, which is indicated by the THRE becoming HIGH. Step 6:- For Transmitting a String, below function is used. To send string data one by one we used the character function from above step. Step 7:- For Receiving a string, interrupt service routine function is used here because an ESP8266 Wi-Fi module will transmit data back to the RX pin of LPC2148 whenever we send AT command or whenever an ESP8266 sends data to LPC2148, like we send data to a webserver of ESP8266. Example: When we send AT command to ESP8266 from LPC2148 (“AT\r\n”) then we get a reply “OK” from the Wi-Fi module. So we use an interrupt here to check the value received from the ESP8266 Wi-Fi module as the ISR interrupt service routine has the highest priority. So whenever an ESP8266 sends data to RX pin of LPC2148 the interrupt is set and ISR function gets executed. The VICintEnable is vectored interrupt enable register used to enable interrupt for UART0. The VICVecCnt10 is vectored interrupt control register that allocates slot for UART0. Next the VICVectaddr0 is vectored interrupt address register that has the interrupt service routine ISR address. Then we have to assign the interrupt for RBR Receive buffer register. So in Interrupt enable register (U0IER) we set for RBR. So that interrupt service routine (ISR) is called when we receive data. Finally, we have the ISR function that needs to do certain task when we receive data from ESP8266 Wi-Fi Module. Here we just read the received value from the ESP8266 that is present in the U0RBR and store those value in the UART0_BUFFER. Finally at the end of ISR the VICVectAddr should be set with zero or dummy value. Step 9:- As ESP8266 Wi-Fi module should be set in the AP mode, we need to send the respected AT commands from LPC2148 by using the UART0_SendString() function. 2. Sends AT+CWMODE=2 (Setting ESP8266 in AP mode). To Program ARM7-LPC2148 we need keil uVision & Flash Magic tool. A USB Cable is used here to program ARM7 Stick via micro USB port. We write code using Keil and create a hex file and then the HEX file is flashed to ARM7 stick using Flash Magic. To know more about installing keil uVision and Flash Magic and how to use them follow the link Getting Started With ARM7 LPC2148 Microcontroller and Program it using Keil uVision. Complete program is given at the end of the tutorial. Note: While uploading HEX file to LPC2148 you must not power the ESP8266 Wi-Fi Module and the FTDI module that is connected with LPC2148. Step 1:- After uploading HEX file to LPC2148, connect the FTDI module to PC via USB cable and open the putty terminal software. Select Serial and then Select the COM port according to your PC or LAPTOP mine was (COM3). The baud rate is 9600. Step 3:- Now press RESET button on the LPC2148. After that LPC2148 begins to send AT commands to ESP8266. We can see the response of that in the putty terminal. Step 4:- As you can see in the image above the ESP8266 is set in MODE 2 that is AP mode and the address of APIP is 192.168.4.1. Note this address because this address will be hard coded in the webpage HTML code to control the LED connected to LPC2148. Important: When ESP8266 is in AP mode you must connect your PC to the ESP8266 AP. See the image below my ESP8266 module shows AP in the name of ESP_06217B (It is open and has no password). In this HTML page, we have created two hyperlinked buttons to Turn on and off the LED from webpage. The webpage will be shown as below in the web browser. Here the address is the AP IP address 192.168.4.1 and we send values @ and % to switch ON and OFF the LED by using this logic below in LPC2148. This is how a device can be controlled remotely using ESP8266 and ARM7 microcontroller LPC2148. Complete code and explanation video is given below.